We only had three requirements for our honeymoon: Thatched roofs, be unplugged, and no children. Since we both have demanding work hours, and the wedding planning packed our schedules even more, all we wanted was to relax on a tranquil beach without having to worry about ringing phones and email alerts. We were also aiming for a location we hadn't been to before. When looking at places around the Caribbean, South America, and Southeast Asia, nothing really jumped out at us. Ultimately, we found Fiji. And of course, many resorts had our three requirements. But after careful consideration, we realized a week in Fiji wouldn’t be enough. So we decided to add a second part to our trip and spend a week in New Zealand. Since we would only be there for about a week, we chose to stay at Queenstown for the scenery. Our challenge was that we had about a $7,000 budget to cover airfare and accommodations, and we had to it stretch over two weeks and two locations. After working with a travel agent who specialized in the area, he was able to make our dream a reality. 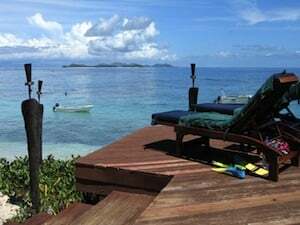 We booked a room at a boutique resort on a small island in Fiji called Matamanoa. 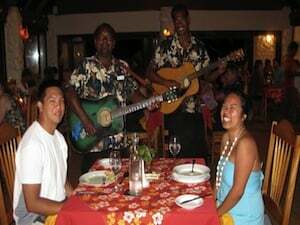 Matamanoa was the perfect honeymoon spot because it only accommodates up to 30 or so couples and doesn't permit anyone under the age of 16. For Queenstown, we booked a spot at a Rydges Lakeside Hotel in a room overlooking Lake Wakatipu and just a short walk to the main part of town. When our travel agent handed us our itinerary, we just couldn't wait to go. Throughout the honeymoon planning, we knew we really wanted to use Traveler's Joy as it was highly recommended by our friends. We were able to break down our itinerary based on flights, accommodations, activities, and even our meals. It showed our guests where we were going, and what we planned on doing. It made our family and friends excited for us to go on this adventure. Each time a person asked us about our honeymoon, we would just point them to the site. We left on Tuesday, October 12th, two days after the wedding. Typical us, we were packing until the last minute and ended up with two backpacks and two small check-in luggage pieces. We were scheduled on a direct flight to Fiji from Los Angeles, courtesy of Air Pacific. Check-in was smooth and the line was fast. Boarding was just as smooth, and while we were still in the airport, we already learned two Fijian words: Bula (welcome) and Vinaka (thank you). After the 10-hour flight, we landed in Nadi, Fiji just at sunrise. We claimed our luggage and found our driver who whisked us away to Denarau Marina. It started raining when we arrived, but it was a pleasant rain. From the marina, we took a South Seas Cruise catamaran to our quaint island resort. It was at this time that we sung praises of our travel agent. Because the water was rough and it was raining upon our arrival in Fiji, he had the foresight to put us in the enclosed Captain's Lounge with free refreshments. Once we got to our stop, they unloaded us onto awaiting dinghies and then off we were to our island! The best part was that when we were near the shore, all the passengers were told to take off their shoes. Yeah, you guessed it. We had to jump into the water and run up to shore. Thank goodness there were feet-washing basins all over the place. Next, there was a welcome drink and warm towels waiting for all of the new arrivals. After a small orientation and introduction to the resort staff, we were led to our own bure. And because it was our honeymoon, we had a welcome fruit basket and bottle of champagne waiting for us inside our home away from home. The entire resort staff was so welcoming and hospitable. We truly appreciated them. We opted for the meal package (all-inclusive), so we only had to pay for drinks as breakfast, lunch and dinner were already covered. We spent the rest of the day getting situated into our bure called "Kabote" and slept between meals. We loved being on "Fiji Time." We really wanted to try the spa, which was situated on a lovely hill overlooking the ocean. The ladies at the spa had basins ready to wash our feet and then we had to walk up the steps to a hut where the massage tables awaited. We had never experienced an outdoor massage before, and listening to the ocean waves for an hour really enhanced the experience. There was a lot to do for such a tiny island. For instance, there was kayaking, snorkeling, and even scuba diving to name a few. There's even excursions to the local village. However, most of our days were spent relaxing by the pool or laying out on the beach. Meanwhile, the food was delicious and local musicians play during dinnertime. At the last dinner there, the staff asked us if we had any requests. Shelly immediately lit up and requested that they play one of my favorite songs, "5 O'Clock Somewhere." They were happy to oblige. Even some of the other guests started singing along! The next day, we had to pack our bags and head back to Nadi on the main island to catch our flight to Auckland, New Zealand. We arrived in Auckland in the afternoon of October 18, so there were no longer any flights to Queenstown for the day. We spent the night at the Copthorne Harbour City, close to the viaduct. After lunch at the hotel's restaurant, we toured the viaduct area and came across a bar that a friend recommended we visit. It was the Minus-5 Bar, where everything inside was made of ice. Indeed, the actual bar, décor, glasses, and even the seats were made of ice. We just a had a few drinks to take in the novelty, then headed out to a local coffee shop before going back to our room. The next morning, we were off on another flight to Queenstown. In Queenstown, we stayed at the Rydges Lakeland Resort. Our room had a beautiful view of Lake Wakatipu and The Remarkables mountain range. Also, the resort was just a five-minute walk from the main center of town, which was quite convenient. We loved trying out the local restaurants and cafes, and I was quite intrigued that every sandwich we ordered automatically had an egg in it. We came to New Zealand for the scenery, and what better way to tour the landscape than to take a tour of the shooting locations from the Lord of the Rings! We took two tours with Nomad Safari Tours, which leads 4x4 Land Rover tours of the filming locations of the movies. The first one was the Glenorchy Tour, where we visited the various farmland and pastures that were landscapes used in the films. We stopped in a tranquil forest where we had coffee and tea, and went for a hike around the woods. The next day, we took the second tour that traveled mostly off-road around the Wakatipu Basin. This tour took us to the more mountainous regions featured in the films, and we also took time to pan for gold. Well, at least just teeny tiny gold flecks in the sand. We also stopped for coffee and tea along the river. As scenic as these tours were, they were not as breathtaking as the tour we took on our last full day, which was a hot air balloon ride across Wakatipu Basin. We had to get up early and travel through the morning fog, but it was well worth it. We watched the grassy field slowly disappear below us just as the sun rose over the horizon, lighting up the landscape and highlighting the low clouds. The surrounding mountains were just gorgeous set against the clear blue skies. I don't believe photographs can do the scene justice. It’s definitely something that one would have to experience in person. 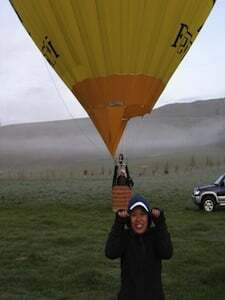 Next up, the balloon landed in the middle of a driving range and we were treated to a champagne breakfast. Afterwards, we headed back to town and up the Skyline Gondola to a luge track. This was a lot of fun, especially since you're riding a sled on wheels down a massive hill with the backdrop of Queenstown and Lake Wakatipu in the distance. We did it five times until our butts got too sore. We ended the day with a stroll around the town and then sadly had to pack up our bags for the flight home. On the morning of October 24, we bid farewell to New Zealand with hopes of returning real soon. We have a ton of favorite memories from the trip, but the most notable was the overall relaxed atmosphere of Matamanoa, plus flying down hill on a piece of plastic with wheels while overlooking Queenstown. We would definitely recommend both of these locations for honeymooners especially for those looking for a warm climate during the winter season. Fiji has such friendly people and is a great couples getaway. For snow sports enthusiasts, New Zealand is a great place to go during the summer, but it’s also busy season and most likely has more crowds. Shelly and I enjoy traveling, and this honeymoon was a great way to kick off the rest of our lives together.